I am on a mission to make getting dressed a pleasure and I am dedicated to helping women look and feel fabulous. My working career began in catering and hospitality. As a friendly individual, I loved the life and the people and providing first class service gave me great job satisfaction. I was fortunate enough to work in several high quality establishments throughout the UK. Having met the man of my dreams, a life in hospitality was no longer practical and I moved into sales and ultimately HR Management where effective recruitment and employee development became my passion. I like to ‘make a difference’ – helping people reach their greatest potential. This variety of personal experience helped to strengthen my understanding of the importance of personal presentation, and the impact that the colours and clothes we wear have upon our personal image. Having worked in a corporate environment for many years, I have an excellent understanding of the desires and pressures faced by many women. As I have grown older I now appreciate how our needs and perceptions can alter, not to mention our bodies! From my own perspective, wearing the right colour palette gave me an instant boost. I believe that in doing so I looked healthier, younger and more vibrant. All the characteristics we look for in our 30’s and as we approach our 40’s, 50’s and beyond. I also felt more able to pursue my career goals with improved self-esteem and confidence. So passionate was I about helping other women enhance their personal presentation and gain extra confidence in their image that I actively grasped an opportunity to change career direction. This relatively new career in Image Consultancy beautifully combines my previous skills. The Federation of Image Professionals International (FIPI) leads the Industry standards in Image Consultancy so having chosen to train with First Impressions, an audited and accredited training provider of FIPI, I am a fully accredited Image Consultant and Associate Member of FIPI. Working with an Image Consultant is no longer a privilege for the chosen few whether in a business or social environment. The results can contribute to life-changing events from new careers; returning to the working scene; seeking promotion or finding a new partner. Using a proven colour and style framework, I can help women enhance their individual physical characteristics, re-connect with themselves and expand their colour, style and image boundaries. I like to get to know my clients and work with each client on an individual basis. 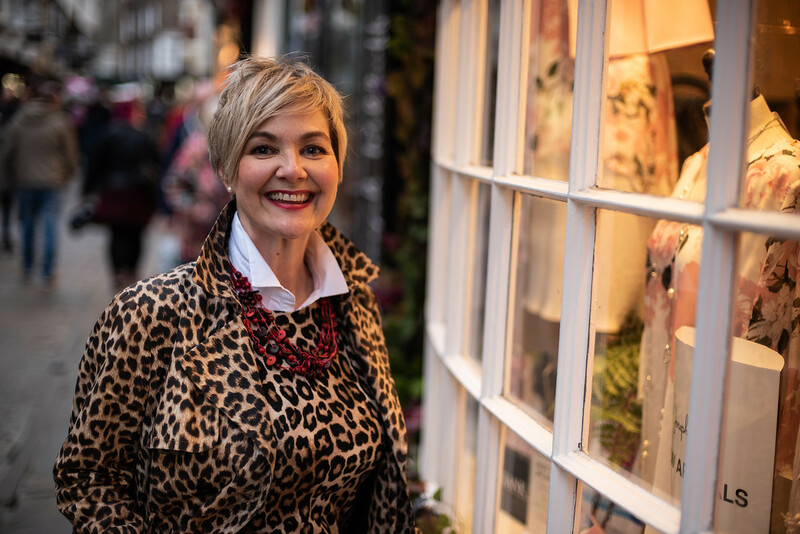 If you are ready to say ‘Goodbye’ to time and money spent on impulse purchases hanging unworn at the back of the wardrobe and ‘Hello’ to the knowledge that leads to successful purchases that awaken your style and complement your lifestyle, perhaps you should get in touch. I would love to hear from you. There is no time like the present to feel good in your clothes all over again. You may be at a point of change and ready for reinvention but don’t know where to start. You want to look great and have the confidence to dress knowing what suits you. Imagine opening up your wardrobe to a selection of clothes that you love! I live in Strensall (6 miles North of York City Centre) and am happiest when walking in the fresh air (preferably on the beach), or tucking into some homemade cake (not fussed about the variety!) with family and friends. As to being most comfortable? Perfectly coordinated in jeans and heels or palazzo pants and girly ruffles – well I am a romantic! I hope that I have inspired you to get in touch so if you’d like to work together, please do give me a call. Consultations are provided on an individual and friendly basis at my comfortable home-studio in Strensall, York.